Are you looking for a challenge to get motivated to move? Or maybe you just like challenges and want to add something different to your routine. My Move It May Workout Challenge is a great way for beginners to get started and a fun challenge for old pros. There is no equipment needed and you can even do the moves while catching up on your favorite tv shows! Each week is a different bodyweight only exercise. You begin with 30 reps and work your way up to 50 reps. You can do the exercise in groupings throughout the day (e.g., 10 reps in the morning, 10 at lunch, etc.) or knock them out all at once. It's your choice! Visit my Where's the Beach Fitness Online Training Website to sign up for weekly email reminders and to find out about new challenges! Don't forget to like me on Facebook, and follow on Twitter and Instagram for check ins and reminders. 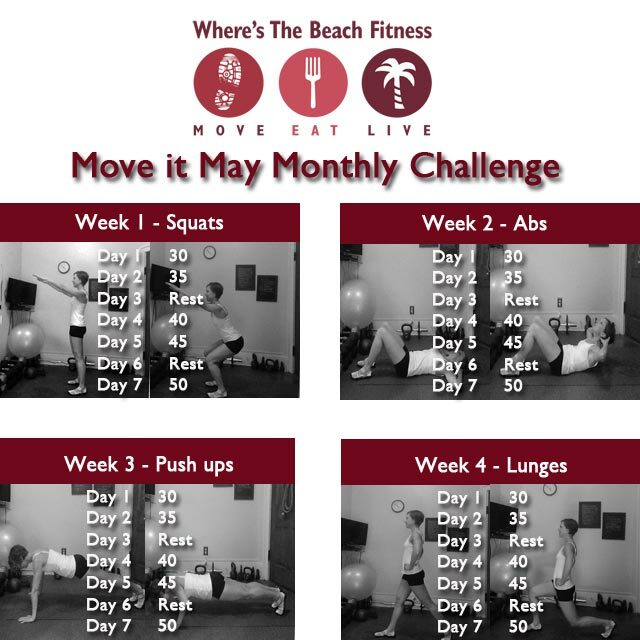 Use hashtag MoveItMayChallenge and/or WTBFitness.